CELESTIAL GATHERING: When the sun goes down tonight step outside and look west. You'll see Venus, Saturn and the bright star Regulus forming a triangle with the crescent Moon inside. A backyard telescope pointed at Venus reveals it to be a crescent, too, almost as slender as the Moon. Take a look: sky map. images: from John Hacker of Carl Junction, Missouri; from Michael Bromley in the Sahara Desert east of Dahra, Libya. "What a treat to see the Northern Lights again," he says. "The sky was glowing mildly until 1 o'clock in the morning when clouds blocked my view." The cause of the display was a solar wind stream hitting Earth and shaking our planet's magnetic field. The reverberations registered 6 on the 0-to-9 K-index scale of geomagnetic storms and produced auroras over both ends of our planet. While Tony Wilder was snapping pictures in Wisconsin, scientist Chantal Steyn took this picture from Queen Maud Land, Antarctica. "We waited almost a month for some auroras, and finally!" she says. Visit the gallery for more. LOOKING AHEAD: Another solar wind stream is due on July 20th. 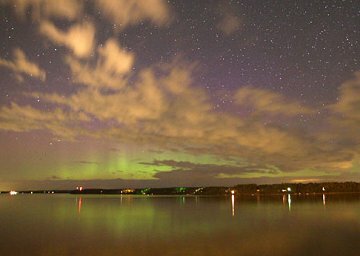 High latitude sky watchers should be alert for auroras. The green tint comes from gaseous cyanogen and diatomic carbon in the comet's atmosphere. Both substances glow green when exposed to sunlight in the near-vacuum of space. The origin of red in the tail is less certain. 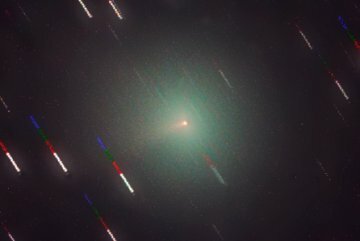 The tail is essentially a jet of dust spewing out of the comet's nucleus. Normally, cometery dust tails are yellow-white, the color of reflected sunlight. But the material in this tail seems to reflect a little extra red--much like another notable red-tailed comet. more images: from Frank Freestar8n of Hudson Valley, NY. On July 16, 2007 there were 874 potentially hazardous asteroids.